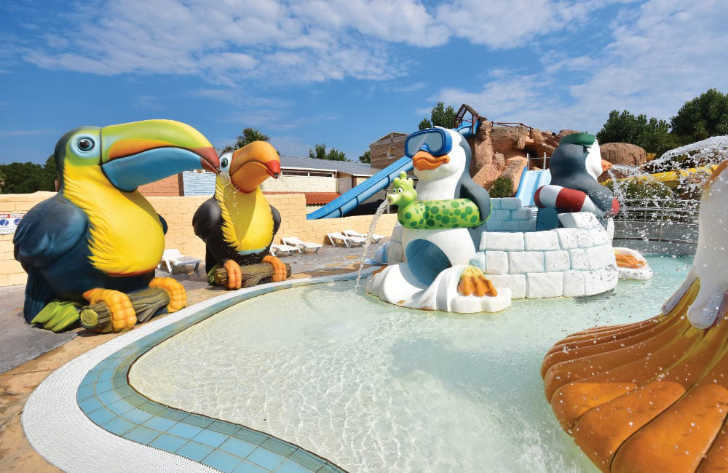 Le Front de Mer campsite is a large, 4 star, extremely popular and very family friendly campsite which occupies a wonderful position along the south coast of France. Lying within a wooded area, the campsite is one of the most beautiful in the area offering spectacular views of the mountains whilst benefiting from some lovely tropical landscaping which gives it a really relaxed feeling. The modern facilities at Le Front de Mer campsite and the location is what makes this fabulous campsite stand out from its competitors. Nearby and also on site you’ll find a fabulous array of activities to keep you busy including, fun fairs, disco’s, bars, restaurants, water sports and much much more. One of the things that makes Le Front de Mer so popular is its close proximity to the beach. Just 200m and minutes from the campsite, you’ll find the stunning beach which stretches out for miles and is perfect for families. The warm sea and fine beaches are the perfect place for you to relax in the sun, swim or play and there’s also no need to feel cramped as the beach is so long you’re bound to find a space. If your a pool person then you’ll love the campsite’s swimming pool complex. Styled in a tropical paradise theme, the complex boasts a number of different pools and slides. On site you’ll find a heated indoor swimming pool with slide, outdoor play pool for younger children with toucan water spouts and penguin slide, a large lagoon swimming pool with waterfalls, nine water slides in total including 2 kamikaze slides and a large amount of sunbathing areas. 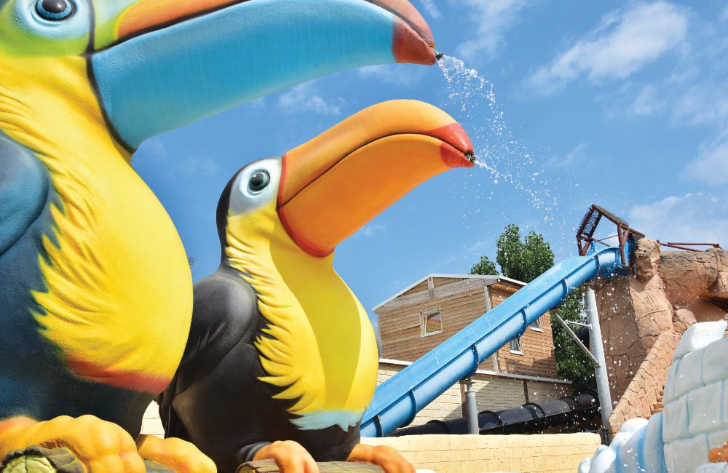 Le Front de Mer campsite offers a comprehensive selection of activities and facilities on site and also nearby to ensure you have a fantastic family holiday. On site activities at Le Front de Mer campsite include a multisports area, football, basketball, volleyball, playground, table tennis, gym, mini golf, wellness area, boules and cycle hire. Facilities available at Le Front de Mer campsite include WIFI, restaurant, snack bar, takeaway, bar, groceries, animation team, games room, washers and dryers. Accommodation at Le Front de Mer campsite includes a range of 2 and 3 bedroom mobile homes that are available from Eurocamp.